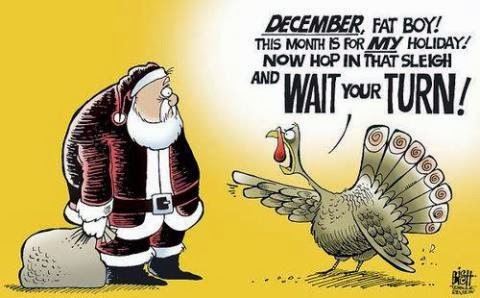 I fully agree with this meme that floats around every year. I do not like that we see Christmas everything beginning in October. I don't understand the rush. I like to savor each holiday as they come. That being said, the day after Thanksgiving is always dedicated to getting ready for Christmas in our house. This year I woke up early enough to make my favorite breakfast, "homemade" donuts. I dug all the tubs of Christmas décor out of storage and started decorating. I love the kokeshi nativity I picked up at a bazaar in Japan. I think it's my favorite decoration. I finally made use of all the stickers the military movers stick to our packing boxes each time we move. We ended our night with a Big Bang Theory marathon and homemade turkey pot pies made with left over Thanksgiving turkey. The perfect transition from Thanksgiving to Christmas. I really want to do the moving sticker ornament, too! What kind of ornament is underneath? That sticker ornament is awesome! You made the ornament! And it's so colorful! I hate you and your nativity set though. I always wanted one, but they were always like $300 and I couldn't see paying that. Now I wish I would have.